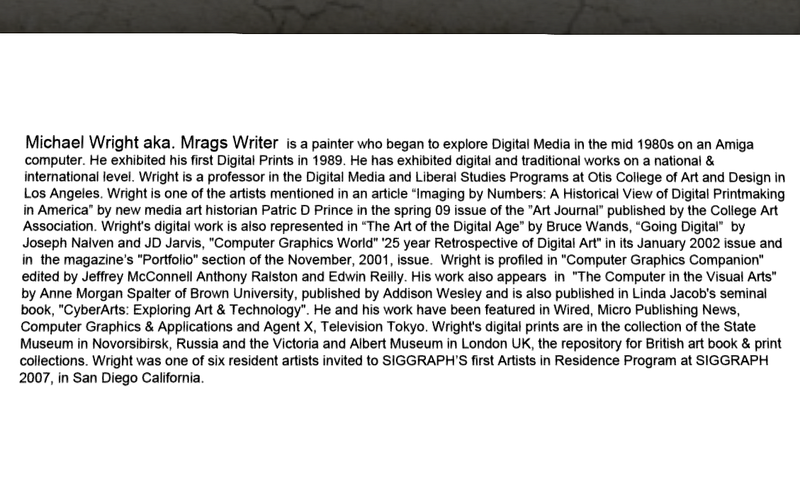 During the last three years I’ve repeatedly visited the Michael Wright Fine Art Museum. 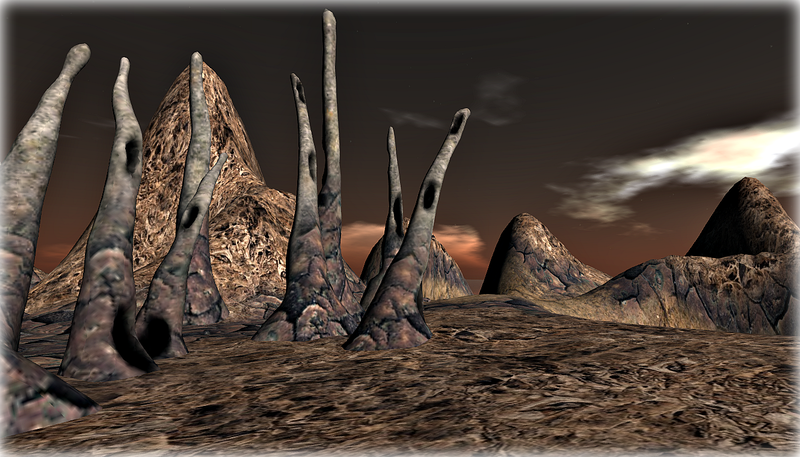 At first I didn’t keep the landmark; it was near something else I would teleport to before wandering down the road. 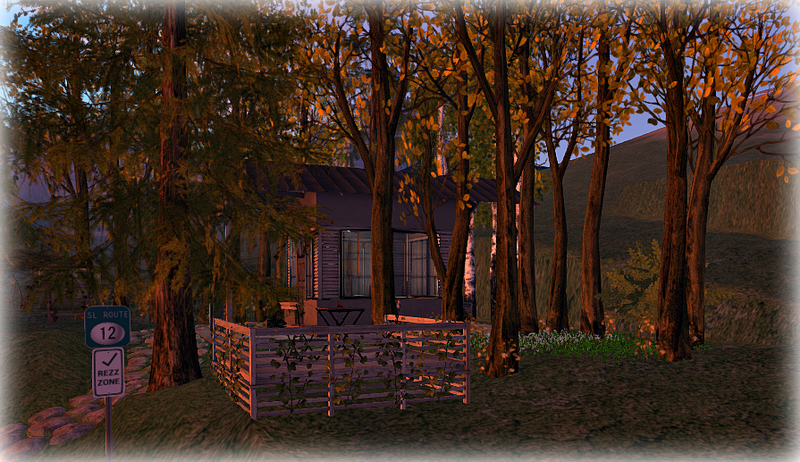 It’s on Route 12 in Nautilus, very close to the Odie Petrol Station which I blogged about on the 18th of this month. You can take a right, leaving each of these places and soon arrive at the other. 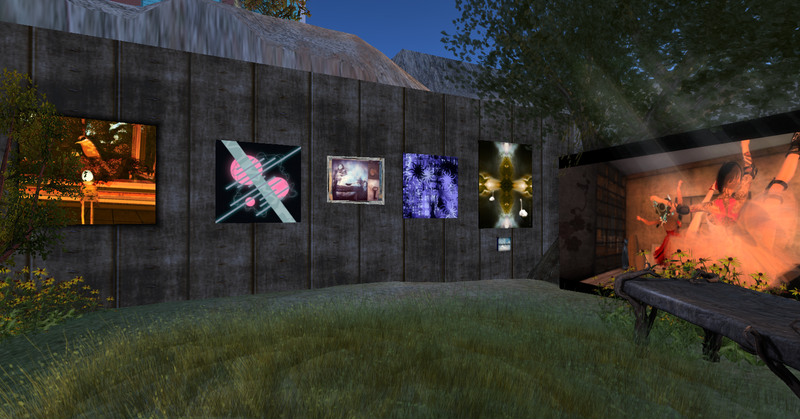 The land description reads: “A Fine Art Gallery representing the work of digital pioneer Michael Wright.” When I first began visiting here, I knew way less about the mainland and hadn’t developed my interest in galleries and art in Second Life. I hadn’t heard of Michael Wright; I just enjoyed the calming experience of visiting here and felt no pressure to study the work. I liked the architecture. 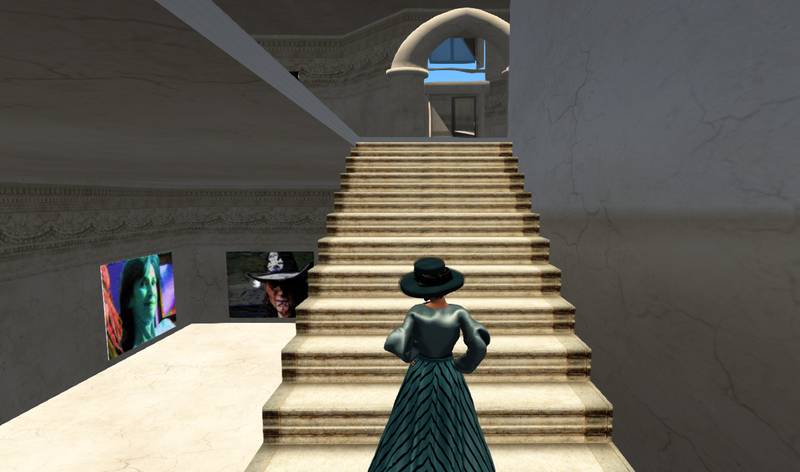 It’s spacious, the ceilings are high, the stairs wide and there are invisiprims on the sides of the stairs and on the landing to keep one from lagging off, which is appreciated when I’m tired and not feeling well. 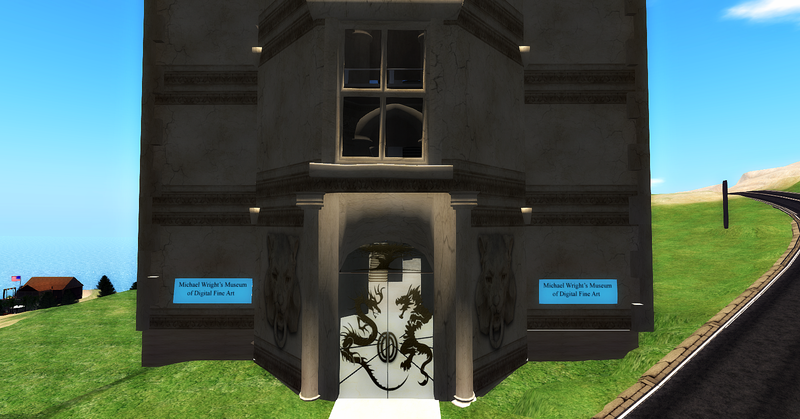 The building appears to have been created for this museum by Juanita Gemma. The land was claimed May 1, 2007. Most of the works are portraits. None are for sale but there are some 3D sculptures on the roof one can purchase. I used to go up to the roof to watch the sun change back before I had any sort of collection of mainland places. I look at two or three of the art pieces each time I visit and have only recently began to mention this location to others. 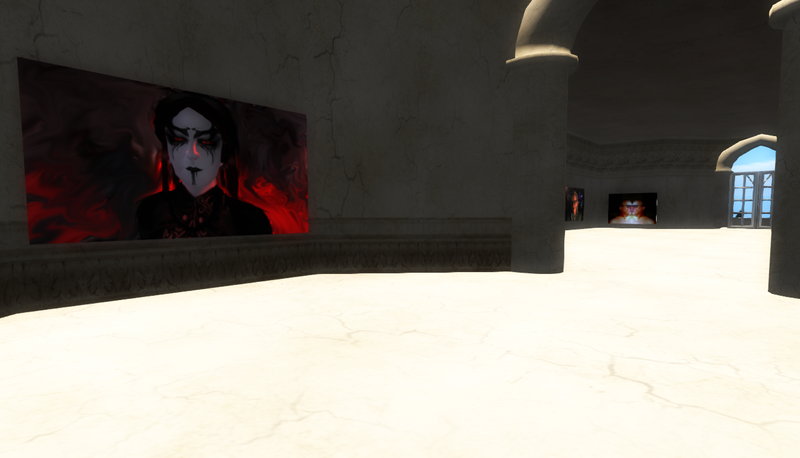 There are some avatar portraits included in the museum. 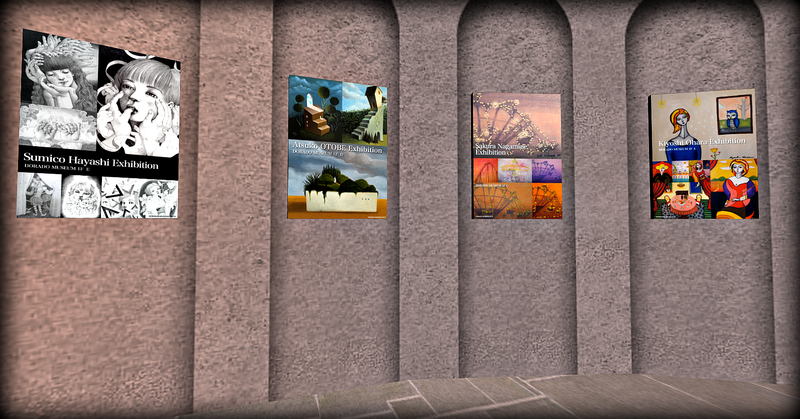 On the second floor, clicking on some of the pieces will deliver a notecard with some info about the artist, an artist statement and LMs to about four other locations inworld where his work can be seen, none of which I’ve visited yet. ” I don’t seek, I find. It’s really a question of perception in the sense that all visual art starts with the eye. 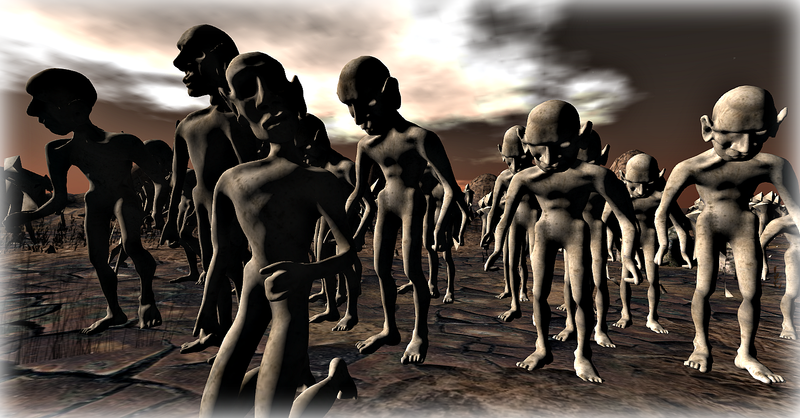 A visual Artist spends their life developing their unique visual eye/view of the world. The computer is the perfect post modern tool/medium, allowing one to explore/ create images, that are soft deconstructed information, layered, appropriated, multi dimensional almost as fast as one thinks. The changes in the image over time are represented as artifacts. The most challenging aspect of creating digital images is making sure that the art will transcend the hardware and software. 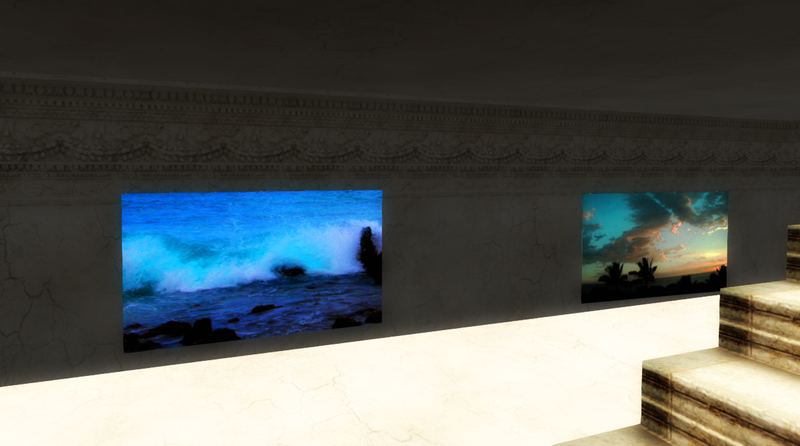 I would like people to respond to the image not how it was created.” On an upper floor are nature scenes, almost all of them seascapes. Above is a photo of the artist bio on the wall. If you click on it, it will become larger and readable. Summer is flying by fast. We changed our monthly turnaround of art to encompass both July and August and there’s about a week left to see the current exhibit. 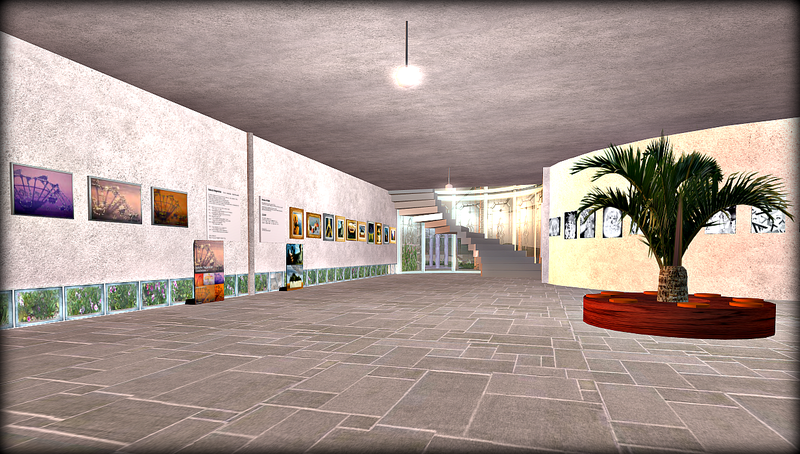 Shown above are images by Muse Beck, RMarie Beedit (for Mainland Modernists group) and Baker Bloch. Most of the participants have been invited but we are welcoming to more, whether you are new or are experienced and simply too busy to do more work intensive shows right now. 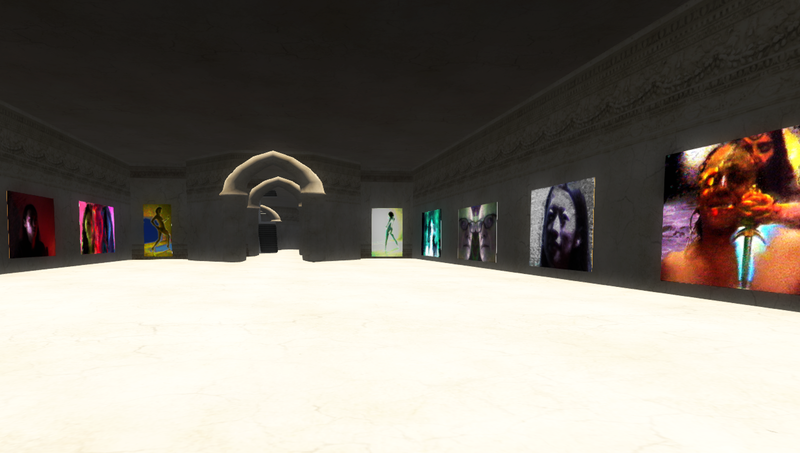 Shown above is art by Quinn, SAULGOODIE, Mango Lassi, Elle Thorkveld, Seraphim Placebo and Isadora Alaya. Here is a vimeo, a little over four minutes, that shows the park during July and August in more detail. While we don’t have a theme, we’ve had a philosophical quote each round which can be accessed by clicking on an image. The piece on the left by Klaus Bereznyak holds the quote for July/August. The travel picture on the right is by Kimika Ying. Some of the destination locations no long exist. 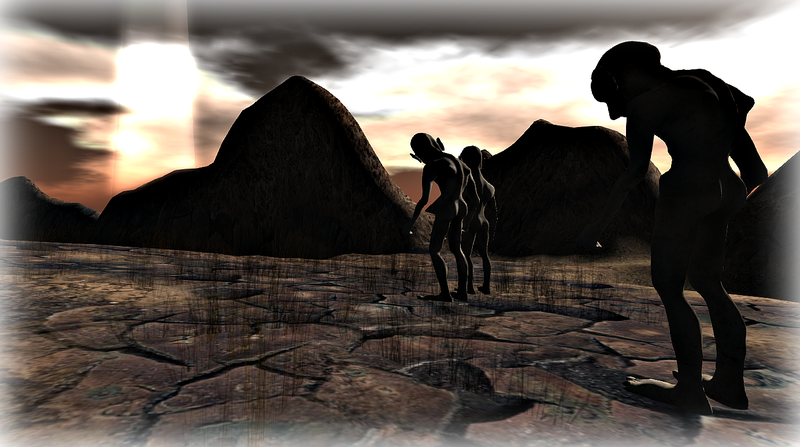 There are more being created right now; check back soon. There’s a suggestion box on the counter of the cafe next door. 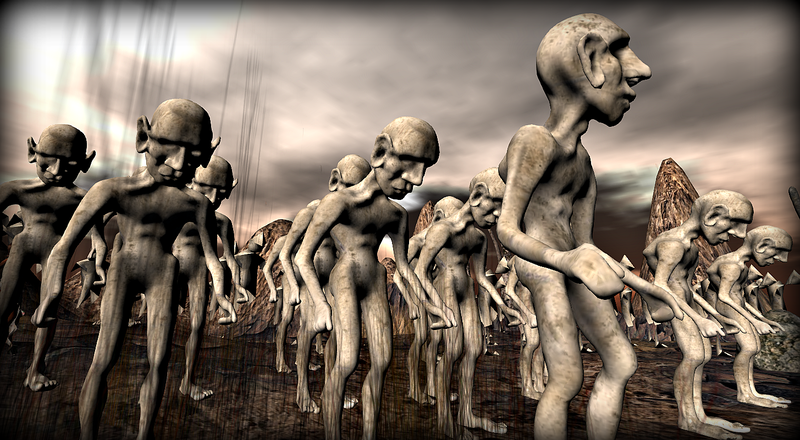 Writers and performance artists are welcome too; there are flexible ways to participate here. 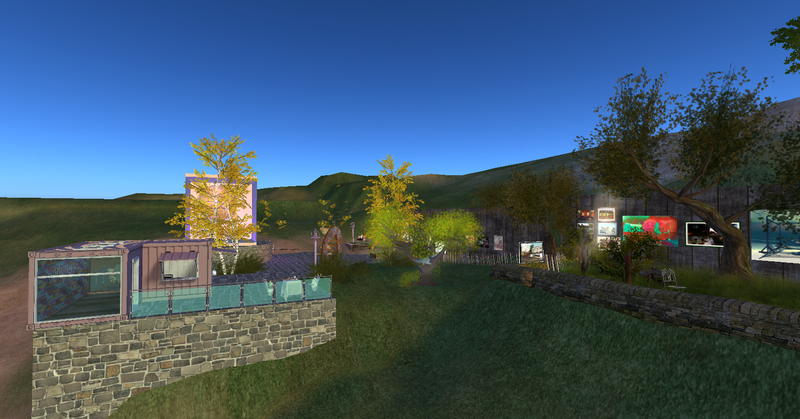 Several new homes have rezzed in the area near the cafe side in the last month or so, not shown here because I keep my draw distance down. The poster area has info of events, exhibitions, a cocktails and talk group and galleries. 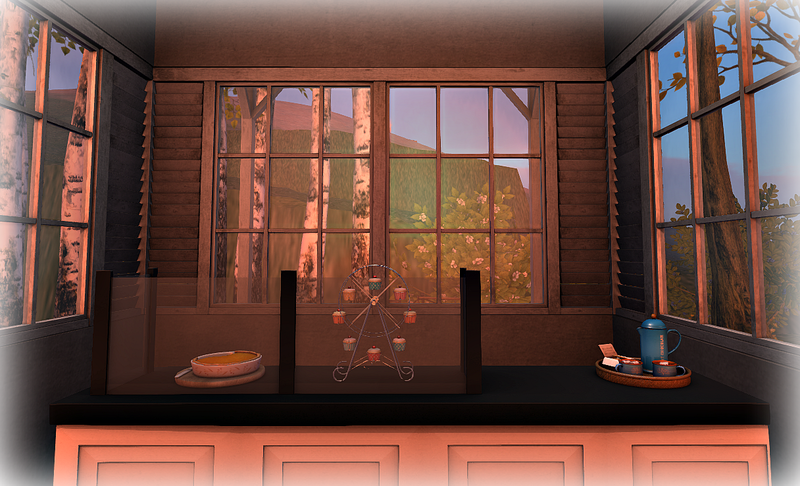 The cafe side is also exhibiting some sculpture by Elle Thorkveld. Wanderlust Bench Art Park and Wanderlust Cafe are located in Quentin on the continent of Sansara. On Route 12 in Nautilus, you can stop for gas and coffee in Odie. 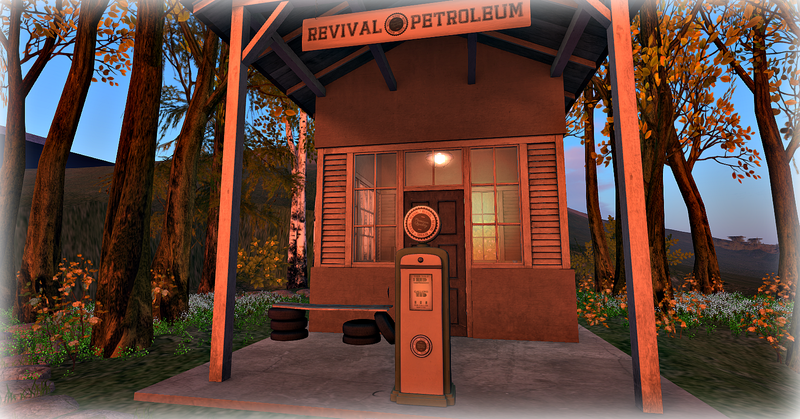 The Odie Petrol Station is on a 512 parcel next to a public rez zone. The station and cafe are owned by Abinoam Norgaard. It’s a great place to start a road trip. It’s happens to be near a place I’ve enjoyed visiting for several years. 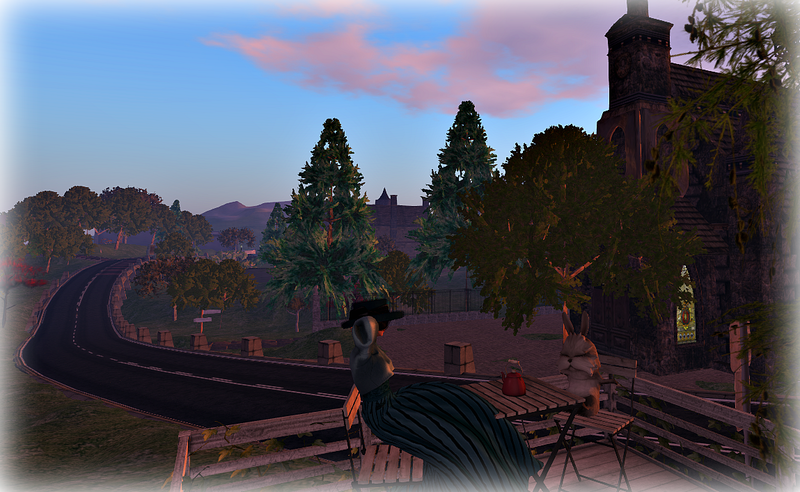 There’s outdoor seating and I recently caught up with a good friend there. The land description simply says “A place where you can fill your tank and have a cup of coffee.” It’s another great example of what can be done with a 512 roadside piece of land. The Dorodo Museum on Corsica introduces some real life artists from Japan. There are a variety of artists represented with information for further exploration. 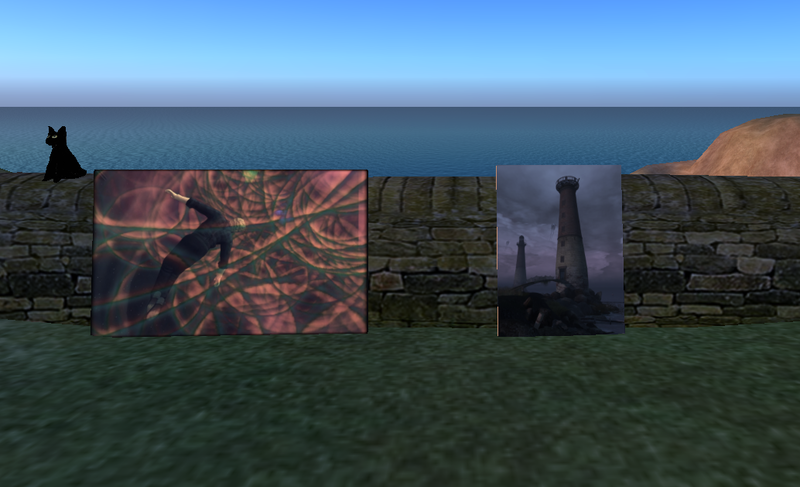 The art can be purchased at a very reasonable price. 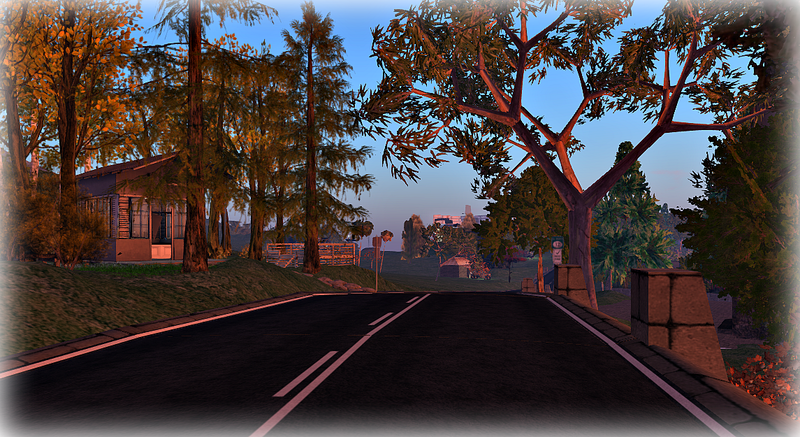 It is Mod/Transfer and most of it looks great in a virtual world. The pieces I bought had resizer scripts. There are posters from some of the real life exhibits. Thanks to Zoe Foodiboo for sending me the landmark to this museum. 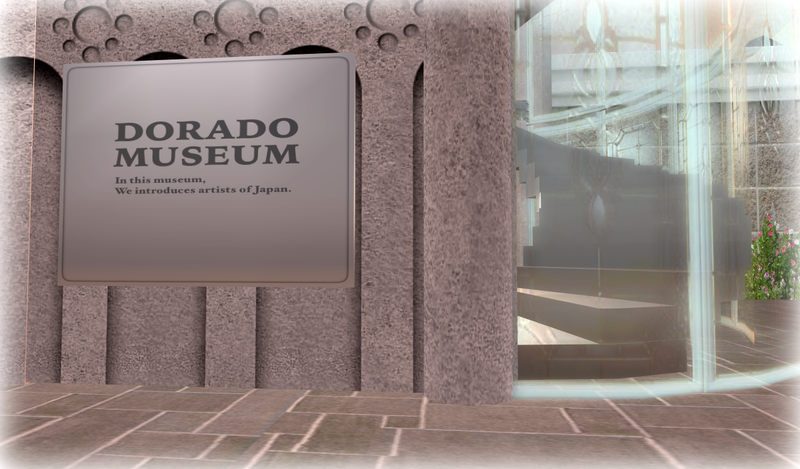 There is a two part post about the Dorodo Museum on the [Second Life] Information blog – mostly photos – part one here. The blog is an excellent resource for finding places on all the mainland continents. 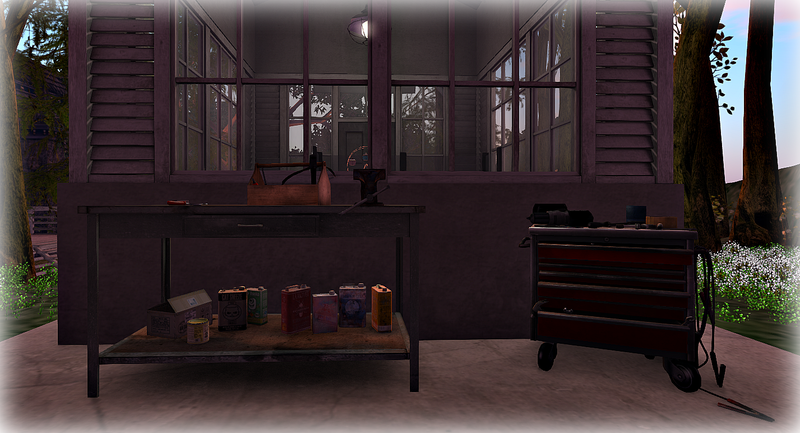 Small shops are included in with the all the other destinations and there have been several posts each day with lots of photos. 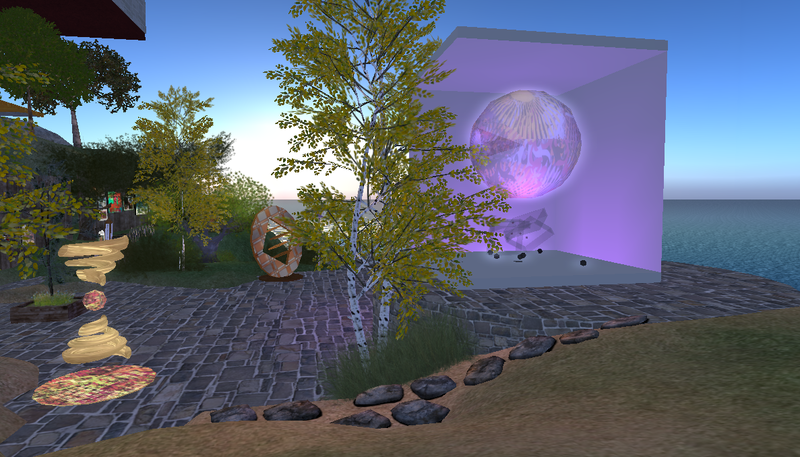 By the way, if you visit the new area next to the museum, to the right of the picture here and to the entrance of the building inworld, you will be teleported home with no warning. I tried to click on the land description when I returned so I could take notes on the owner’s profile (one of several strategies I’m using to help discern among all the requests for support and solicitations which have increased dramatically during the last few months) and found I was now banned and couldn’t get the information. 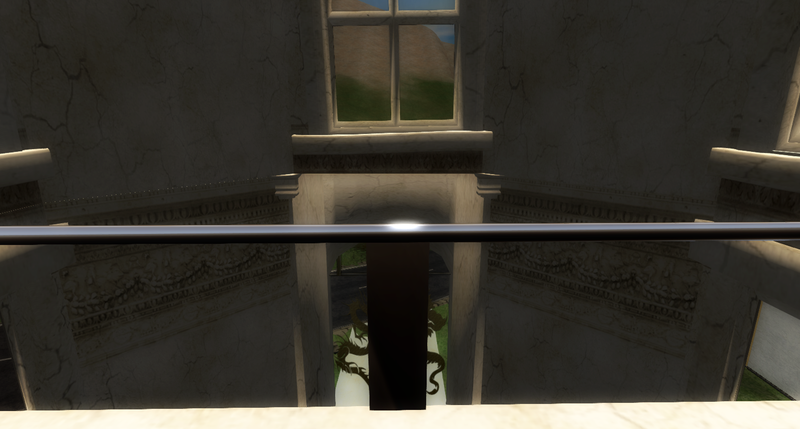 This is my first ban in my almost five years in Second Life.